… sounds stupid? That’s what I thought. But it does seem like this is what this forum letter to our mainstream media The Straits Times is implying. At first look, it may seem like a good and logical idea. But do you really have to get cancer in order to know how to find a cure? In my opinion, school teachers do not have to take the national exams. Why? Unlike independent tutors, school teachers do have strict rules from what I’ve heard from friends who were training to be teachers. That includes lesson planning – what they are going to do for every lesson period or part thereof, how much and how they are going to complete them. With the school HODs leadership, teachers also have to pass down “observations” or “trends” that they see in exam papers. I’m sure those my age (born in the 90’s) would remember how our teachers would tell us Venice was tested in the previous year, this year may be Gorbachev, etc. From the two examples above, it’s pretty clear that teachers are regularly updated on two things – syllabus & examinations, which, unless you are tutors housed under tuition centres, you may not be as well-informed, guided and consistent. Putting aside the black and white school policies and guides, we have to consider the humane side of putting teachers through the examinations. Teachers have a lot on their plates – not only do they have to teach their subjects, they have to mark the papers, prepare worksheets, lesson plans, talk to students who have problems, attend in-school meetings, attend MOE conferences, attend MOE feedback sessions, attend and prepare for Meet-The-Parents, and the endless reports they have to write. And that’s only the academic education part of it. Other responsibilities include taking care of their form classes, make sure the form class students take on an active role in inter-level competitions, keep the classroom clean and to handle students disputes. And the CCA part of it. Attendance, activities, camps, orientation camps, discipline, competitions. School teachers are not just teachers. They have to answer to a lot of people, unlike tutors. They have to make sure they are following MOE guidelines, meeting the school standards, ensuring students’ behavior and performance, and probably the toughest of all – answering to the parents. What would putting them through exams do? It’s another form of pressure, and it leaves them even smaller portion of time for their students. How does that even make sense? The third point that I feel strongly about is the accountability difference between school teachers and private tutors. How can you tell that a school teacher is good? The students’ and parents feedback to school and MOE, the HOD feedback about their fellow department colleagues, the school assessment of how effective a teacher can be for a class of students. Their assessment is more frequent than an outsider can think – it takes just ONE mistake in class for some students to lose respect for their teachers; it takes one test/exam/competition result to reflect a school teacher’s capability. Compared to how relatively easy it may be for a tutor to drop a student, it is way harder for a teacher to say, I can’t teach this kid. Send him to another class, another teacher, another school. The hard truth is – a school teacher isn’t judged just on the two or four hours like a tutor. A school teacher is judged every single day, for every responsibility and every student. As such, a private tutor isn’t comparable to how a school teacher is held accountable. After addressing the issue that the person who wrote has proposed, I thought of looking it from another perspective – why did she think of writing this letter? How did the idea come about? The strongest response I guess she’s hoping to evoke is empathy with the students of the modern times. Students have a lot to deal with – struggles and awkwardness of growing up, handling the angst against everything, performing well in school, being ‘as cool as the other kids’, fitting in, and standing out from the crowd. Just see how competitive education has become – value-added schools may be gone as a term, but it’s staying as a culture. SYFs, CCAs becoming school niche because the team is getting gold for N years, Inter-class competitions, So-and-so went from L1R5 26 to 12. The competitiveness is endless, but whether you are the MOE, the CNY-kaypoh relative or the parent, you’ve only seen a tip of THEIR iceberg. No one truly understands the challenges of being a student, a teenager, a sibling, a girlfriend, a prefect, a cool kid all at once. The letter calls for empathy. A reminder for school teachers that their subject isn’t the only one a student is studying for. They can’t spend all their time, or most of it, preparing for your subject. And to see from their perspective, how hard it is to handle a subject they have no feelings for or maybe even hate. From a tutor’s perspective, they may feel that it’s unfair – why do private tutors have to take the papers in order to prove their capabilities? I think part of it is addressed in the first degree implications – unlike private tutors, school teachers are constantly held accountable and have a solid system of rules, guides and goals to hit. 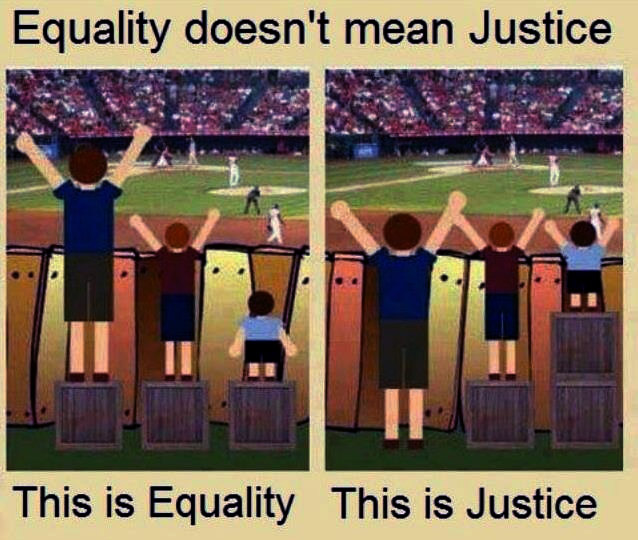 Here’s where I come to my next point – Equality and Justice are two different things. This following picture is a perfect explanation of their differences. In order to reach the same goals, different people have to put in different amount and different type of efforts. Private tutors don’t have to handle CCAs, report to MOE, follow strict guides. They don’t have a school endorsement, so they have to create their own, pretty much like a start-up blogger. You have to do your own ads, take your own time through batches and batches of students to accumulate experiences, build up your reputation, gain trust and find the best way to teach certain topics or theories. But some private tutors may not have noticed the great thing about this – you can create your own value. You can take on as many students as you feel that you can handle. You can become a celebrity in your industry. You can choose how to spend your time, and what values you want to create for yourself. You can choose how to market yourself. Most of which, school teachers do not have the liberty to. If school teachers have to prove themselves like private tutors, and that according to a report private tutoring sector is making big money, who would still want to be a school teacher? This push for equality, isn’t and cannot be justified. School teachers and private tutors are like rice and soup. The rice is your staple, at least that’s what your culture tells you. Some people are okay without the soup entirely either because they don’t need it or they are okay struggling to eat without it. Others feel that the more the merrier, and they’d rather be over-nourished. But you can’t say that as long as the rice is good, people won’t crave for the soup that much. Back in primary school, my Maths was great, but I still went for Maths tuition. Why? I was horrible in English grammar and since I was signing up for English, why not sign up for Maths and Science too? People have the mindset that tuition not only help weaker students to get up to speed, but also to strengthen understandings and foundations for the smart students. It’s the culture of “the more the merrier” that has to change. Our culture has to say “eat in variation and in right portions”, not “it doesn’t harm to eat more”. So my point is – putting school teachers to the test isn’t going to influence the reliance on tutors to a large extent. It’s the kiasu culture that has to bring about that change. You don’t have to get cancer to find a cure. If everyone is just like everyone else, there’s no point for a difference in pay, in freedom, in restrictions among many other things. If you want to change a trend, don’t take it on the elements, be it teachers or students. Look at the bigger picture, and start changing from the culture. Also, can you do all that a school teacher is doing? Take on their load the next time before you consider to “Make them” do something.